Line from the film: "Five? I killed nearly twice that many in the war"
The screenplay for Joshua, a 1976 low-budget western, was written by “The Hammer” himself, Mr. Fred Williamson, star of such ‘70s blaxploitation classics as Black Caesar and Bucktown. This, along with the fact that Williamson also plays the title role, should have been enough to make Joshua a worthwhile experience for genre fans. Alas, its weaknesses outweigh its strengths, and in the end, the movie wasn’t nearly as entertaining as I hoped it would be. The U.S. Civil War is over. Sam (Henry Kendrick), a rancher, lives on a spacious plot of land in Monument Valley with his mail-order bride (Brenda Venus) and his maid, Martha (Kathryn Jackson). One day, Martha receives a letter from her son, Joshua (Williamson), telling her that, now that the war is over, his tour of duty with the U.S. Cavalry is at an end, and he’s coming home to see her. Before he arrives, however, a band of thieves, led by a cutthroat named Jed (Cal Bartlett), shows up at the ranch. Having taken a liking to Sam’s new bride, Jed decides to kidnap her. When Sam protests, Jed shoots him in the shoulder, then turns his gun on Martha, murdering her in cold blood. The next day, a newly-arrived Joshua is informed of his mother’s death. Using his military training, he tracks her killers over mountains and through the driving snow, forcing the gang to ride further than they ever have before. But Joshua has no intention of letting a single one escape their fate, and is ready to chase them to the ends of the earth to exact his own brand of justice. Joshua does, on occasion, show promise, most of which comes courtesy of its star. 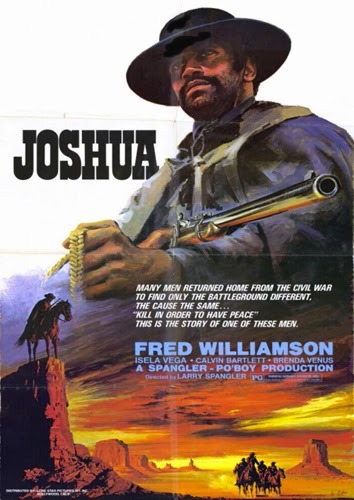 As expected, Williamson is superb in the title role, putting his own unique spin on the “Man with No Name” persona by portraying Joshua as a loner; a former soldier who relies on his wartime experiences to hunt down those responsible for killing his beloved mother. With nothing left to live for but revenge, Joshua dedicates his every waking moment to seeing that it’s carried out. He speaks very little (his guns talk loud enough), and pity anyone who stands in his way (one particular showdown with three guys in a bar is over before you can blink). With his tough demeanor and no-nonsense attitude, Williamson’s Joshua is the quintessential anti-hero, the kind of character made popular in the Spaghetti Westerns of the ‘60s and ‘70s. His performance, coupled with the beautiful Monument Valley setting, make Joshua a movie I come damn close to recommending. Unfortunately, I can’t; its problems are far too numerous to ignore. Aside from Williamson and Cal Bartlett, who’s quite good as Jed, the remainder of the cast is fairly weak (Ralph Willingham, who portrays Weasel, a member of Jed’s gang, gets my vote as the most annoying God-damned outlaw in the history of western films. His constant, and often indistinct, muttering is bad enough, but Weasel also has a cackle more shrill than the Witch in The Wizard of Oz). Even more problematic than the performances is the film’s pacing. Too much time is dedicated to showing characters riding around on horseback, which, more often than not, slows the movie to a crawl (nearly every action scene is followed by at least a minute or two of riding). We also have no idea why Joshua decides to take the outlaws out one-by-one. Many times throughout the film, he’s given a chance to end his quest with a couple well-placed shots. Why he chooses to act so slowly, not to mention so elaborately (instead of shooting one guy, he climbs onto the roof and drops a rope around his neck, strangling him to death), is never once explained, leaving me with the distinct feeling it was done solely to pad the film’s running time. A movie I was looking forward to seeing, Joshua proved to be one of the bigger disappointments I’ve had since I started this challenge. I really wanted to like Joshua, and it pains me to say it didn’t live up to my expectations.